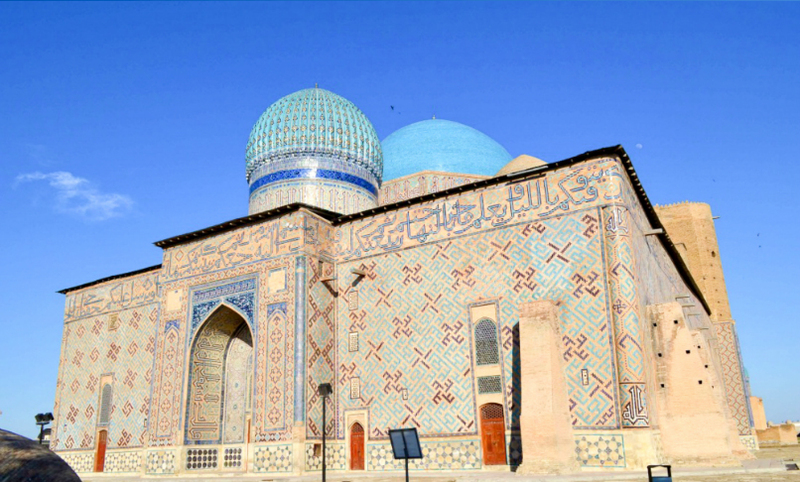 The Mausoleum of Khoja Ahmed Yasawi, an eminent 12th century Sufi master, is situated in southern Kazakhstan, in the city of Turkistan. 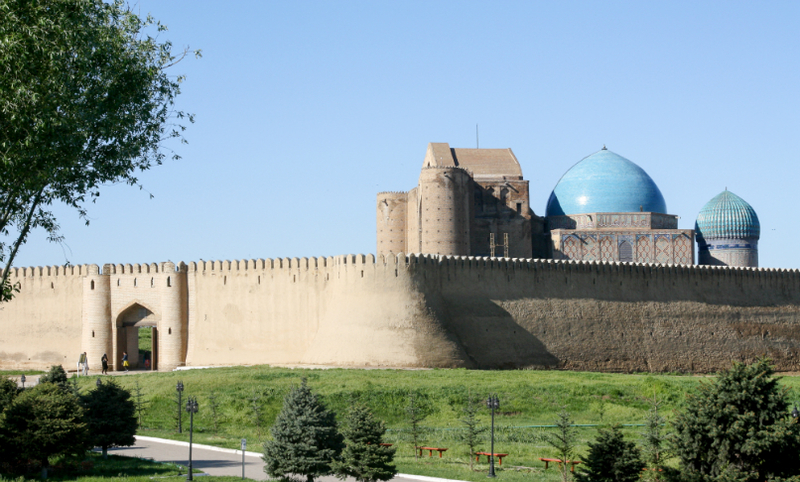 Built between 1389 and 1405 by Timur (Tamerlane), the Ruler of Central Asia, it replaced a smaller 12th century mausoleum. 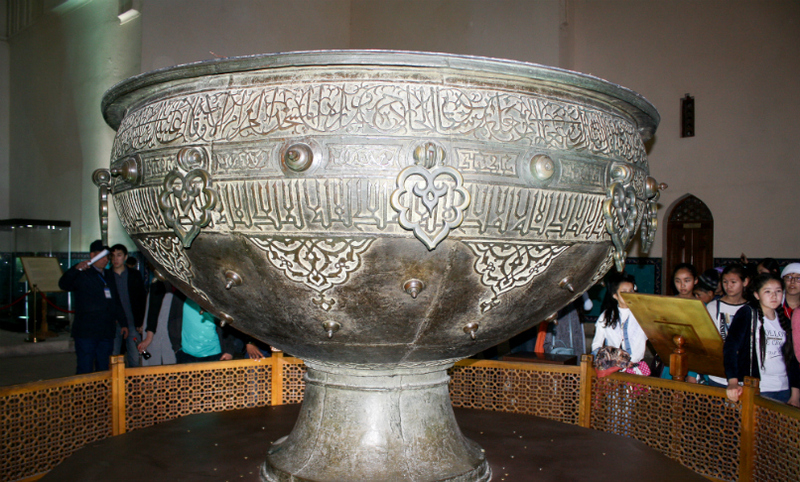 However, on the death of Timur in 1405 construction of the mausoleum was halted and it was never completed. 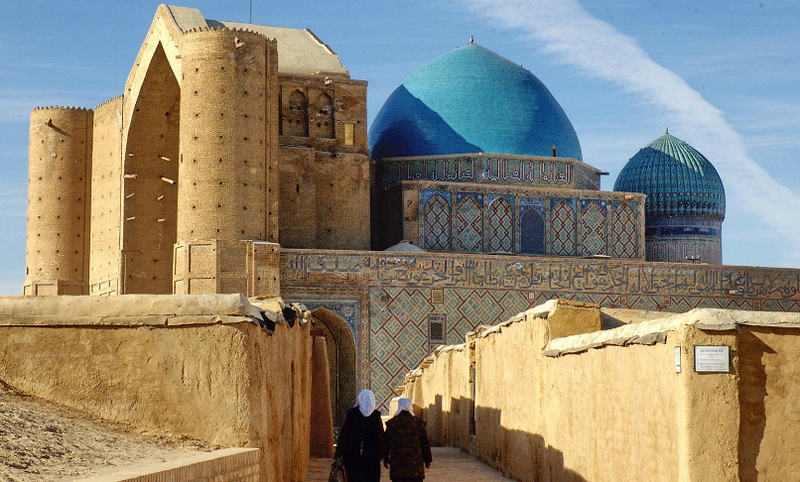 The unfinished mausoleum stands within a former citadel in the medieval town of Yassi, modern-day Turkistan. 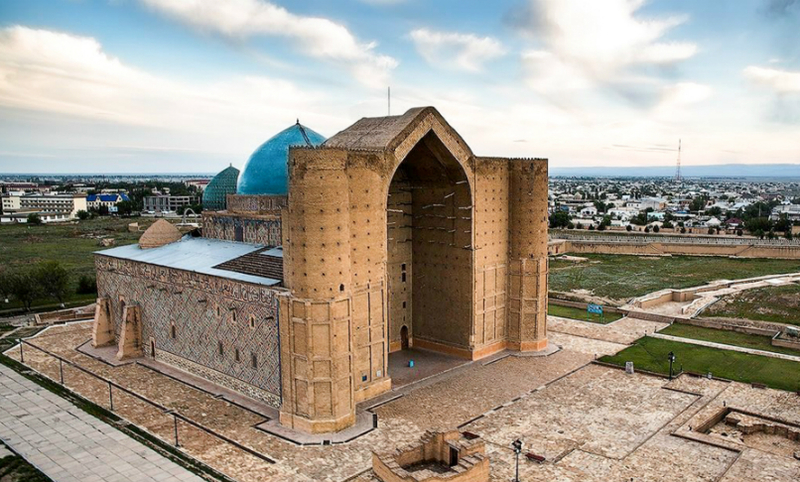 The rectangular mausoleum is just under 39 meters tall and, despite being unfinished, is one of the best-preserved and most outstanding examples of Timurid architecture. Skilled Persian craftsmen were employed to work on the project and Timur himself is reported to have participated in the building work. 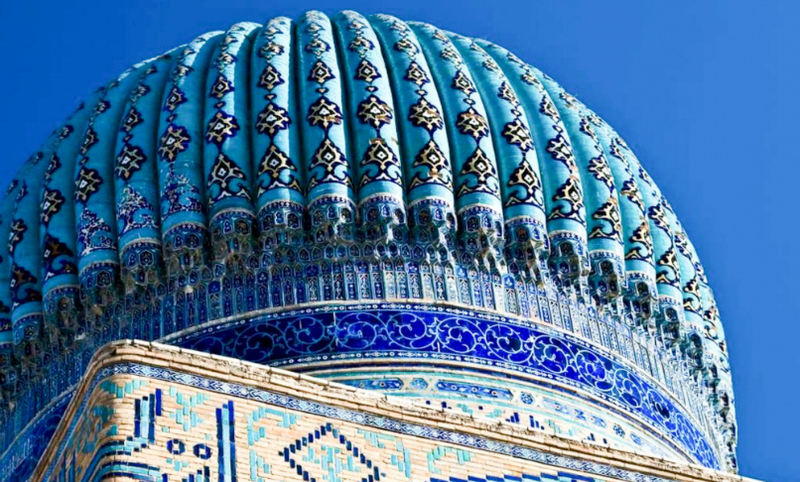 The mausoleum’s innovative spatial arrangements, vaults, domes and decorations served as prototypes for other major Islamic buildings of the Timurid period, in particular those in Samarkand, the city in Uzbekistan famous for its beautiful mosques and mausoleums. 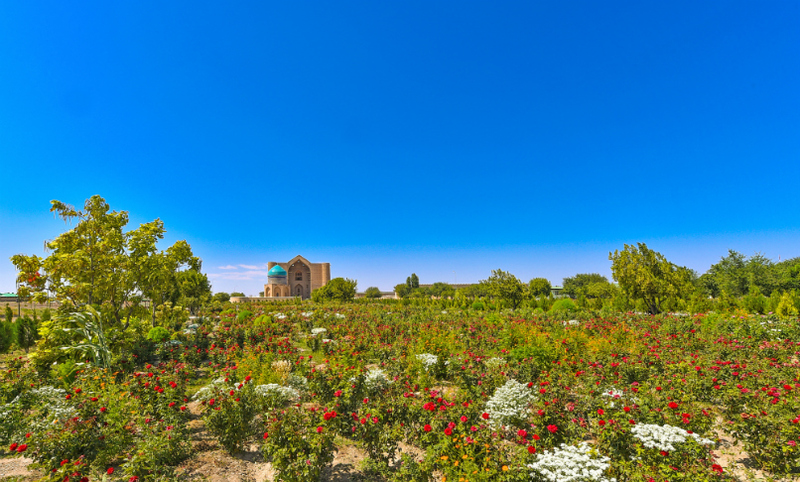 Constructed of fired brick, the Mausoleum of Khoja Ahmed Yasawi has 35 rooms and contains thirty-five rooms that have a variety of functions. 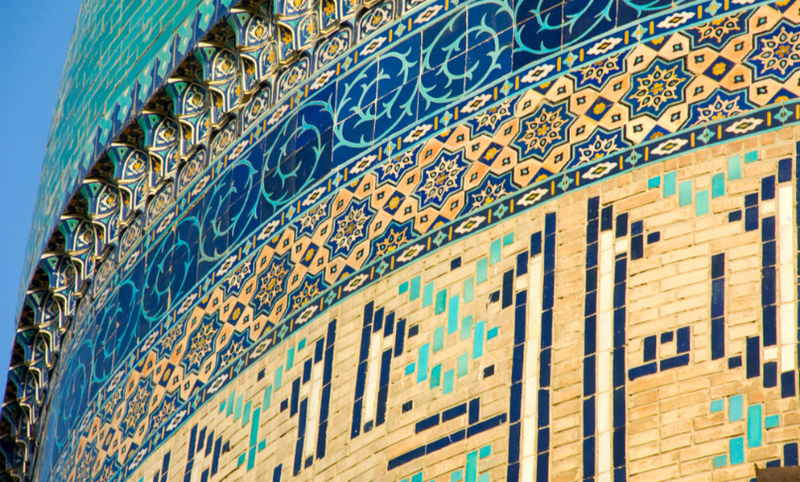 A conic-spherical dome, the largest in Central Asia and decorated with beautiful turquoise tiles, sits above the main hall (kazandyk), there are fragments of the original wall paintings, alabaster stalactites (muqarnas) in the intrados (the lower or inner curve of an arch), glazed tiles featuring geometric patterns and epigraphic on the exterior and interior walls, fine Kufic and Suls inscriptions on the walls and texts from the Qu’ran. The main entrance and parts of the interior were left unfinished, providing significant evidence of the construction methods of the period. Details of the life of Khoja Ahmed Yasawi himself are sketchy. He was born around 1103 in Sayram, a city in south east Kazakhstan, at that time known as Ispijab. His father, Sheikh Ibragim, was a well-known local figure, but Ahmed was orphaned at the age of seven and moved to Yassi with his elder sister, his only remaining close relative. His teacher was the venerable Arystan Bab, also known as Arslan Bab (both names meaning ‘lion’). 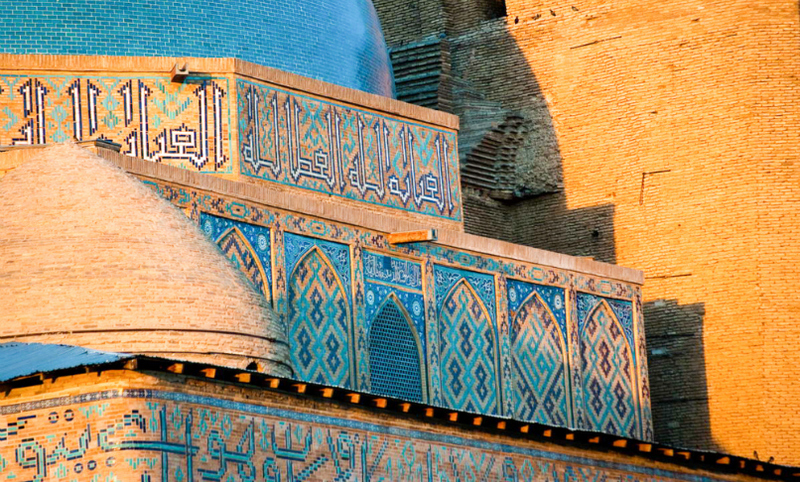 On the death of Arystan Bab, Khoja Ahmed Yasawi moved to Bukhara in Uzbekistan, where he became a disciple of Sheikh Yusup Hamadani, an important figure in the development of Sufism in Central Asia. 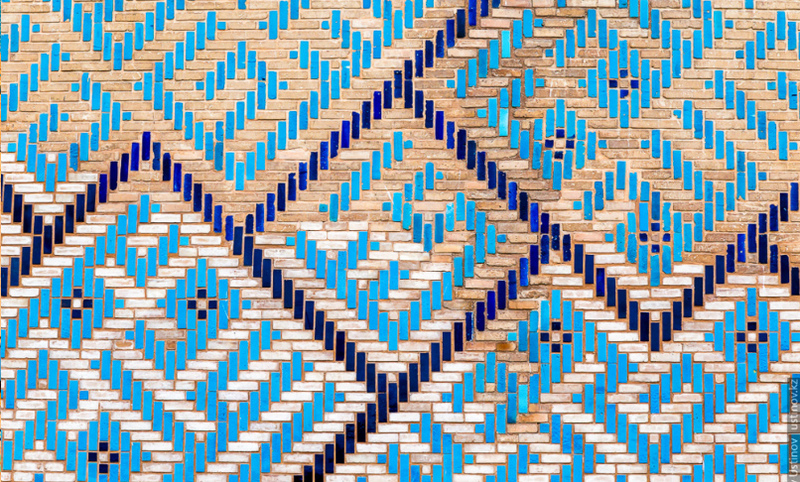 He then returned to Yassi, taking the name Ahmed Yasawi, and became a highly successful propagator of Sufi Islam. He died around 1166. Throughout his life, Yasawi had the gift of communicating to ordinary people through poems and sermons in Turkic vernacular, a major reason for his enduring popularity. His poetry was much later collected in the book entitled Divan-i Hikmet. When he reached 63, the age the Prophet Muhammad died, he retired to an underground cell, where he lived in prayer and contemplation, explaining that he had no wish to live a worldly life longer than that of the Prophet. 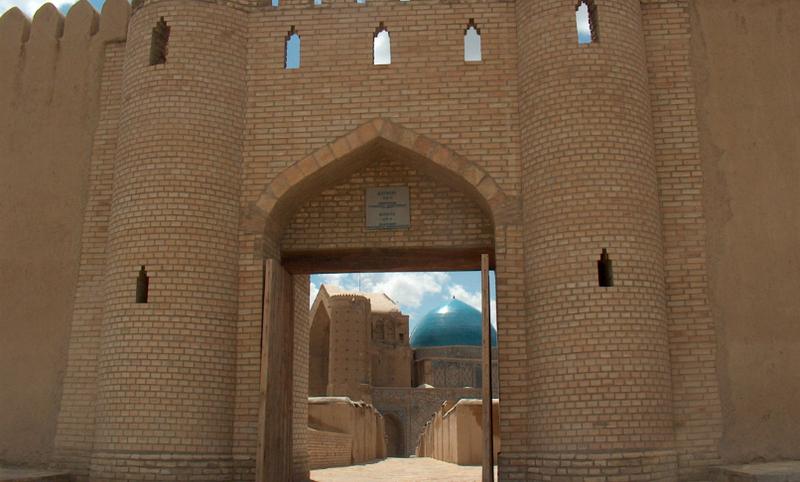 His original small tomb was already a place of pilgrimage before Timur commissioned his grand mausoleum. 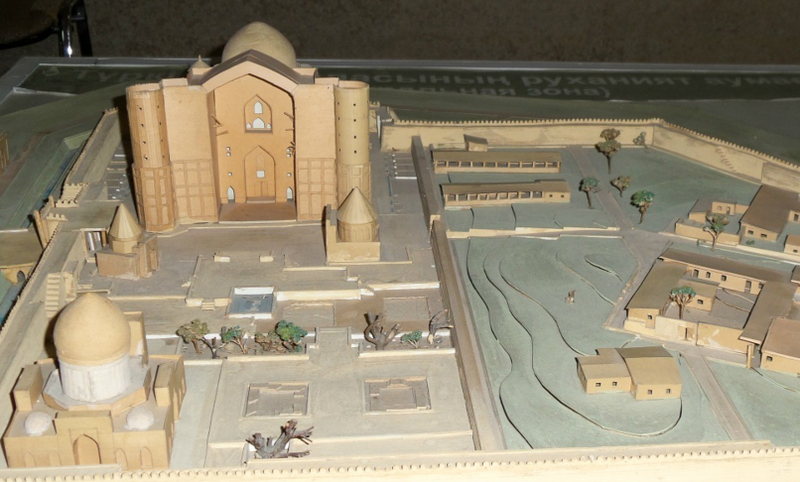 Yassi became capital of the Kazakh Khanate between the 16th and 18th centuries. 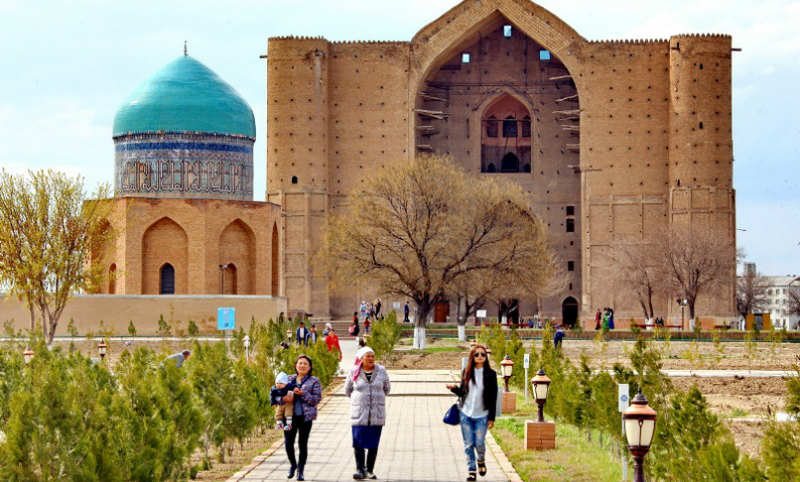 Kazakh leaders chose it largely because of its spiritual significant, allowing them to claim the Islamic heritage of Khoja Ahmed Yassawi, as well as part of the legacy of Timur. 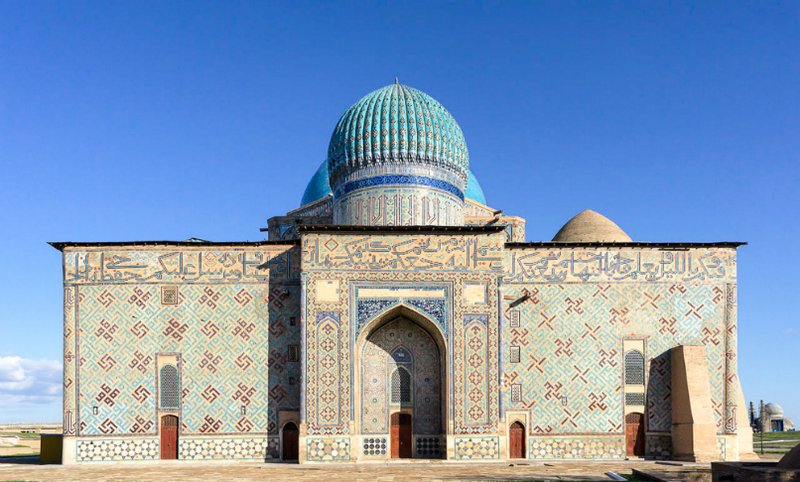 Many Kazakh Khans (rulers) and other senior figures were buried here, reflecting the traditional belief that burial close to the grave of a saint would provide protection in the next world. Among the first burials was that of Amanbike, daughter of Janybek, co-founder of the Kazakh Khanate, in 1519. 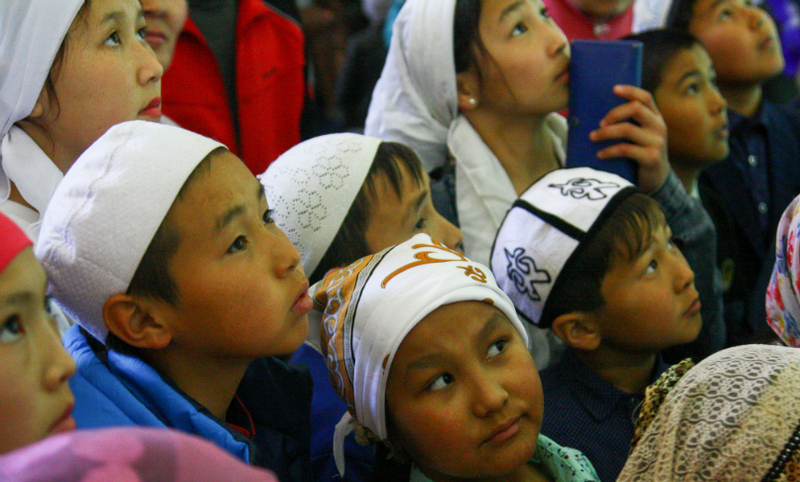 Yassi was also the scene of many Kazakh khan coronations, among them Ablai Khan in 1771.